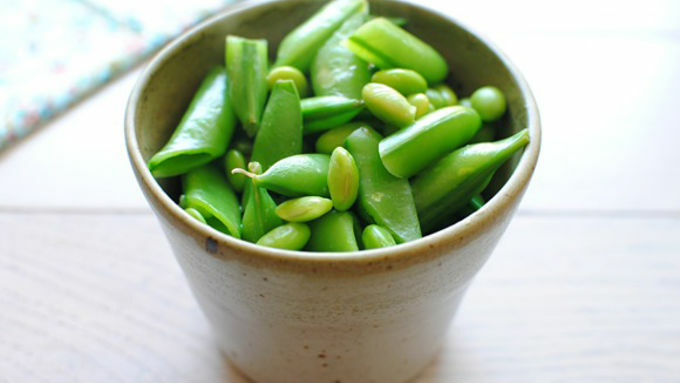 Cook the edamame in boiling water for about 4 minutes. Add the snap peas and boil 1 more minute. Using a spider or slotted spoon, remove from water and set aside. 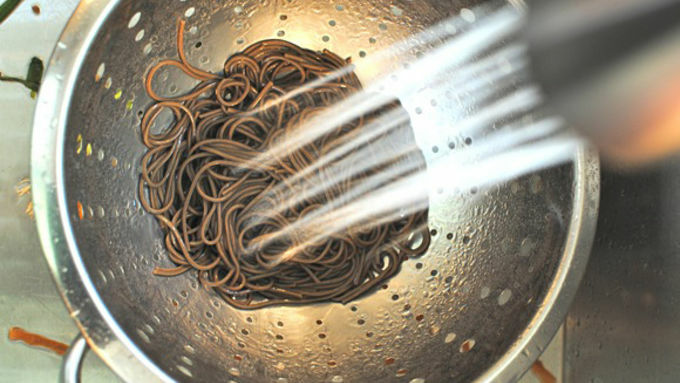 Add the soba noodles and cook until al dente, about 6 minutes. Drain and rinse under cool water. In a medium bowl, whisk the soy sauce, oil, brown sugar, lime juice and scallions. 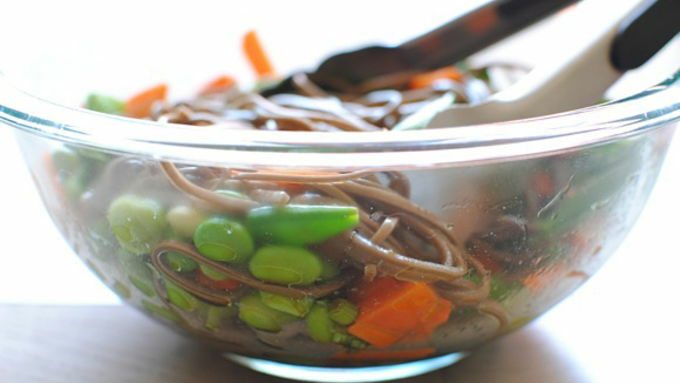 Add the soba noodles, edamame, snap peas and carrots to the bowl and toss to coat with the dressing. 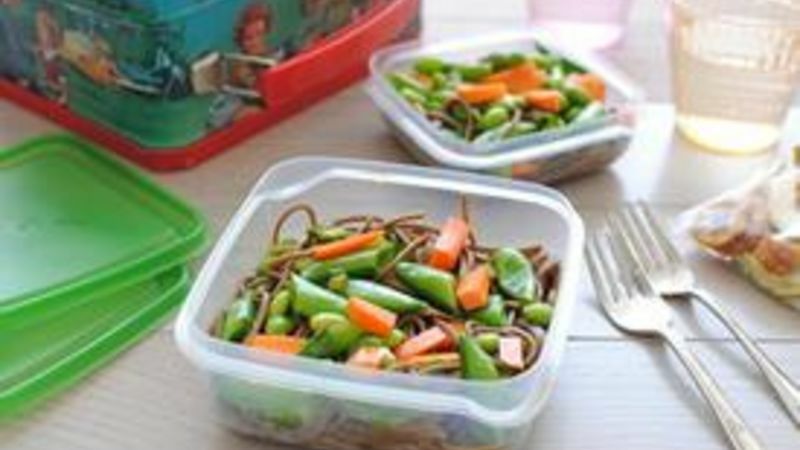 Divide among 2 small to-go containers and pack them in a lunch box for your kids. *Garnish with cilantro or peanuts if desired. I'm sorry, but didn't kids just get OUT OF SCHOOL? I'm seeing all these back-to-school commercials about #2 pencils and notebooks and crayons and scissors and I can like, SMELL the supplies. In a good way. A fresh box of crayons? Mmmm. And the mix of lead and wood in pencils? Seriously yum. Oh! And Elmer's glue! Get this, one time in college I smeared glue all over my face at a party, let it dry and then walked up to a cute boy and smiled really, really big. My entire face cracked and rippled and it was NOT AT ALL adorable. But I sure got a kick and a half out of it. You're like, THIS EXPLAINS SO MUCH. 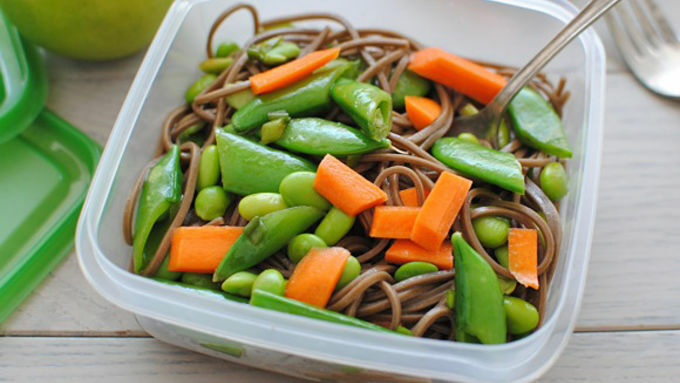 Let's make some super simple lunch box-style soba noodles for kiddos! I kept this pretty mild, having young taste buds in mind, but by all means, if your littles dig the spice, add some sriricha sauce of sambal oelek. And then make them spell sambal oelek. Depending on how much your munchkins eat, you might want to adjust the ingredients, but I figured one soba noodle bundle would feed two kiddies. Divide it up among the kids' school containers and they're basically set for life. Colorful veggies, healthy buckwheat soba noodles, and a zesty lime dressing. Your kids are so hip. This is just in case you needed to ENVISION it in the lunch box. And yes, mine was totally Annie. Wanna make something of it? Now I wanna go back to school, ugh.